If a custom transformer is linked, you can create a newer version that contains any updates you made to it. After you create a new version of a custom transformer, the older version remains in any existing workspaces. However, that older version can no longer be added to any workspaces, either new or existing. Any subsequent times you add the custom transformer to a workspace will always reference the newest version. You might consider creating a newer version of a custom transformer if your updates will cause existing workspaces to produce unexpected results, but will not affect new workspaces. For example, changes to input and output ports inside the custom transformer might warrant updating to a newer version. The procedure for creating a newer version of a custom transformer differs slightly depending on whether multiple versions of the custom transformer already exist, or if only one version currently exists. Select File > Save on the menu, or click the Save icon on the toolbar. The custom transformer is now saved as Version 2. To create Version 3 or later of a custom transformer. Select Create New Version and click OK. 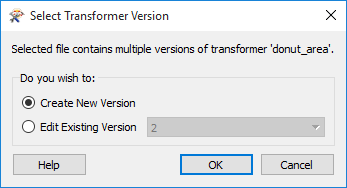 The custom transformer is saved and opens as the next version. When you open a custom transformer, you can see the version number in the Navigator, under Transformer Properties.